Below are just some of the victims from the crisis facing these kind creatures. They're now the lucky ones, The Rescued! 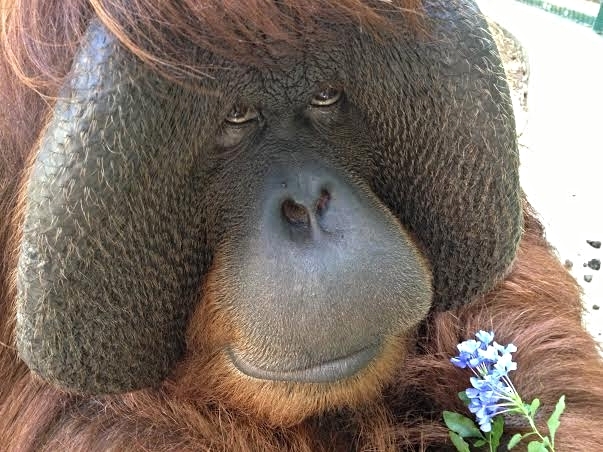 Gober is an elderly Sumatran female orangutan who went blind due to age-related cataracts. When she began raiding farmers’ crops, villagers asked SOCP to remove her from the site. Gober entered the quarantine centre in November 2008. 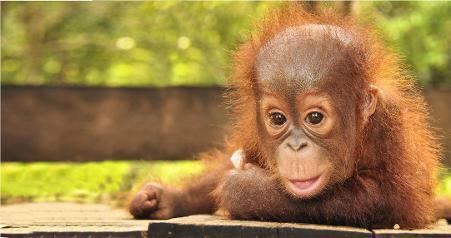 Kept alone at first, in 2009 she was gradually introduced to another blind orangutan, a male named Leuser. Unexpectedly, Gober fell pregnant and in February 2011 delivered healthy twins – a male and female. The male’s name is Ganteng (meaning “handsome”) and the female is Ginting (a common family name from the local quarantine area). The infants are thriving under Gober’s care and she’s doing a perfect job of rearing them. In 2012, following a surgical procedure on her cataracts, Gober’s sight was partially restored! Rickina- Cared for by International Animal Rescue, Ketapang. 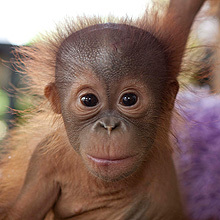 Kalimantan, from a man who claimed that he had encountered a mother orangutan with the baby in the forest, and that the mother was so startled that she abandoned the baby and ran away. The man picked up the baby and in doing so apparently caused a gaping wound on her head with his machete…. 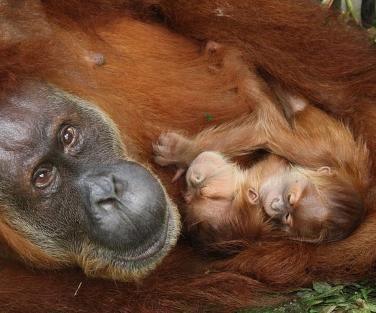 A mother orangutan will never leave her infant behind and will fight to the death to protect her baby from aggressors. So what really happened? Linus arrived at the Center for Great Apes in 2006. When he arrived he could barely walk, trembling constantly and becoming winded from the slightest exertion because lack of exposure to sunlight in his garage cage for years, and limited space for movement and exercise. His hair was matted with pounds of feces, and it took caregivers many months of effort to groom him through the mesh and cut out the mats. Yet Linus was patient and gentle. Linus is now fascinated by textures, particularly fabrics, and he also hoards paper products such as cardboard boxes, paper bags, and wrapping paper. Every time he moves indoors or outside, he carefully gathers up all his blankets, boxes, and bags and carries them with him wherever he goes.